Welcome to our Game In Progress review of Ni No Kuni II: Revenant Kingdom. This third and final installment focuses on the game’s ending and includes discussion of the entire game. With steampunk labor disputes solved, fantasy racism defeated, and all the kingdoms of the world united in an effort to pursue everlasting peace, all that’s really left to see in Ni No Kuni II’s final stretch is the bland B-story that’s been languishing in its background for a few dozen hours. It’s always been there—in each moment when the evil wizard Doloran shows up to sever and steal the bond between a ruler and their nation, muttering something about a lost love and some great world-destroying beast he plans on reviving—but the arcs of the little countries you visit and befriend do a great job of keeping that more conventional story out of the spotlight. It’s been so thoroughly ignored that by the time it becomes the game’s main concern, it’s under-developed and you’re rushed through its worthless twists and trite world-threatening dramatics at a head-spinning pace. To their credit, most of the big revelations in these final hours continue to draw from the game’s broader theme of good intentions leading to cruel ends. We learn Doloran used to be a king, too, the leader of the hilariously named, tragically destroyed kingdom of Allegoria. He wants nothing more than to see it, and its fairy-like guardian whom he’d fallen in love with, restored. The only problem is his method for doing so involved sucking out the souls of countless people and just generally ruining everything. 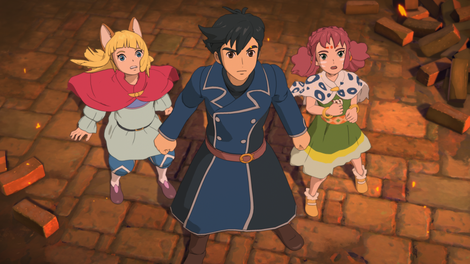 It’s also here that the game borrows a concept from the original Ni No Kuni and reveals for anyone who hadn’t already figured out this ridiculous anagram-based twist that Doloran and Roland are mirror images, two souls connected across the borders of their respective dimensions. It’s a novel invocation of that prior concept—and one of the few instances of Revenant Kingdom calling back to its predecessor—and gives at least a little explanation for the bonkers introductory scene in which Roland, apparent president of the United States, watches his country get nuked, just as Doloran watched Allegoria crumble. But it’s an otherwise useless wrinkle that mainly exists for a cheap twist and to stop the heroes from quickly killing Doloran to end his scheme in seconds. The more thematically satisfying foil for Doloran is Evan. He also had his kingdom snatched from him, but unlike the villainous mage, he was able to let go of that memory and set out to build something new, something better. Evan never marched Evermore’s army into Ding Dong Dell and reclaimed his birthright. What’s more, by the end of his time revisiting his former home, one even gets the sense he fully accepts Mausinger, a representative of the country’s formerly disadvantaged mouse people, as the ruler Ding Dong Dell deserves. But Doloran, clouded by desire and bound by the past, never considered the possibility of leaving old Allegoria behind (not until, in one of the game’s hurried final scenes, Evan himself points out that starting from scratch is still a perfectly reasonable option). Instead, just like all the world leaders he corrupted throughout the game, he followed a road paved with good intentions straight to one-note cartoon villainy. The big difference between him and, say, Broadleaf’s power-mad President and CEO Zip Vector is that Doloran doesn’t have an interesting locale or real-world political parallel livening up his storyline. He’s just a bundle of fantasy cliches with a cool snake mask, and even that goes out the window once he reveals his face and lame anime haircut. The ending’s other big twist, regarding the identity of the mysterious boy who’s been having dream-like conversations with Evan, is somehow even more nonsensical and inconsequential. 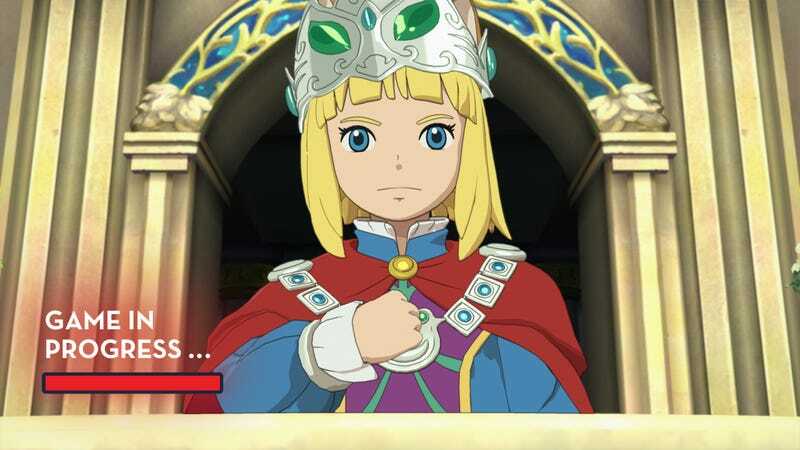 In these moments it’s worth remembering that Ni No Kuni is a series that purposely skews toward pat storybook construction, and this twist is there to give the whole affair an over-the-top “Happily Ever After” ending, spelling out that Evan was awesome and things in this world get even more awesome once the game’s story concludes. The same result could’ve easily been achieved with an epilogue, which plays right into the picture book aesthetic and would’ve saved it from this choice that is both completely baffling and contradictory of previous plot points. This mishandling of the game’s ending and the secondary storyline it serves as the culmination of seems like the result of Revenant Kingdom’s priorities lying elsewhere. As I said last week, the game isn’t interested in telling a deep or even consistent story. All of its energy is invested elsewhere—in a combat system that’s sleek and leads to large, chaotic melees; into the two periphery modes that could be games unto themselves, the monotonous idle-game-style kingdom management and the awkward rock-paper-scissors of its simplified real-time-strategy battles; and most of all, into the strange cities you visit and the pointed political fables they tell. Thankfully, its stumbles represent a small portion of a game that’s surprising in the issues it’s willing to invoke and revitalizing in the unwavering optimism with which it stares them down.